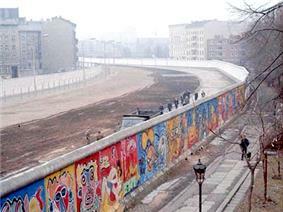 Photograph of the Berlin Wall taken from the West side. The Wall was built in 1961 to prevent East Germans from fleeing and to stop an economically disastrous drain of workers. It was a symbol of the Cold War and its fall in 1989 marked the approaching end of the war. Historians have not fully agreed on the dates, but 1947–1991 is common. The term "cold" was used, because there was no large-scale fighting directly between the two sides, although there were major regional wars, known as proxy wars, in Korea, Vietnam, and Afghanistan that the two sides supported. The Cold War split the temporary wartime alliance against Nazi Germany, leaving the USSR and the US as two superpowers with profound economic and political differences: the former being a single-party Marxist–Leninist state operating planned economy and controlled press and owning exclusively the right to establish and govern communities, and the latter being a capitalist state with generally free elections and press, which also granted freedom of expression and freedom of association to its citizens. A self-proclaimed neutral bloc arose with the Non-Aligned Movement founded by Egypt, India, Indonesia and Yugoslavia; this faction rejected association with either the US-led West or the Soviet-led East. The two superpowers never engaged directly in full-scale armed combat but they each armed heavily in preparation for a possible all-out nuclear world war. Each side had a nuclear deterrent that deterred an attack by the other side, on the basis that such an attack would lead to total destruction of the attacker: the doctrine of mutually assured destruction (MAD). 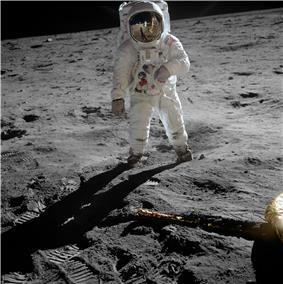 Aside from the development of the two sides' nuclear arsenals, and deployment of conventional military forces, the struggle for dominance was expressed via proxy wars around the globe, psychological warfare, massive propaganda campaigns and espionage, rivalry at sports events, and technological competitions such as the Space Race. With victory of the Communist side in the Chinese Civil War and the outbreak of the Korean War (1950–53), the conflict expanded. The USSR and USA competed for influence in Latin America and decolonizing states of Africa, the Middle East and Southeast Asia. Meanwhile, the Hungarian Revolution of 1956 was stopped by the Soviets. The expansion and escalation sparked more crises, such as the Suez Crisis (1956), the Berlin Crisis of 1961, and the Cuban Missile Crisis of 1962. Following this last crisis a new phase began that saw the Sino-Soviet split complicate relations within the Communist sphere while US allies, particularly France, demonstrated greater independence of action. 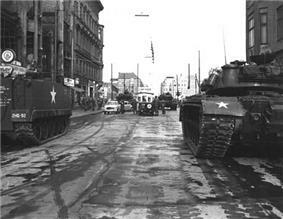 The USSR crushed the 1968 Prague Spring liberalization program in Czechoslovakia, and the Vietnam War (1955–1975) ended with a defeat of the US-backed Republic of South Vietnam, prompting further adjustments. 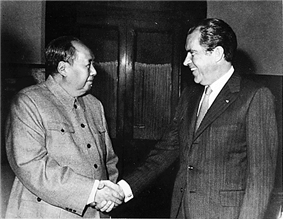 By the 1970s, both sides had become interested in accommodations to create a more stable and predictable international system, inaugurating a period of détente that saw Strategic Arms Limitation Talks and the US opening relations with the People's Republic of China as a strategic counterweight to the Soviet Union. Détente collapsed at the end of the decade with the Soviet war in Afghanistan beginning in 1979.
glasnost ("openness", c. 1985) and ended Soviet involvement in Afghanistan. Pressures for national independence grew stronger in Eastern Europe, especially Poland. Gorbachev meanwhile refused to use Soviet troops to bolster the faltering Warsaw Pact regimes as had occurred in the past. The result in 1989 was a wave of revolutions that peacefully (with the exception of the Romanian Revolution) overthrew all of the Communist regimes of Central and Eastern Europe. The Communist Party of the Soviet Union itself lost control and was banned following an abortive coup attempt in August 1991. This in turn led to the formal dissolution of the USSR in December 1991 and the collapse of Communist regimes in other countries such as Mongolia, Cambodia and South Yemen. The United States remained as the world's only superpower. Looking at the world as a whole, the drift for many decades has been not towards anarchy but towards the reimposition of slavery....James Burnham's theory has been much discussed, but few people have yet considered its ideological implications—that is, the kind of world-view, the kind of beliefs, and the social structure that would probably prevail in a state which was at once unconquerable and in a permanent state of "cold war" with its neighbours. In The Observer of 10 March 1946, Orwell wrote that "after the Moscow conference last December, Russia began to make a 'cold war' on Britain and the British Empire." The first use of the term to describe the specific post-war geopolitical confrontation between the USSR and the United States came in a speech by Bernard Baruch, an influential advisor to Democratic presidents, on 16 April 1947. The speech, written by journalist Herbert Bayard Swope, proclaimed, "Let us not be deceived: we are today in the midst of a cold war." Newspaper columnist Walter Lippmann gave the term wide currency with the book The Cold War; when asked in 1947 about the source of the term, Lippmann traced it to a French term from the 1930s, la guerre froide. Allied troops in Vladivostok, August 1918, during the Allied intervention in the Russian Civil War. As a result of the 1917 Bolshevik takeover, Soviet Russia found itself isolated in international diplomacy. Leader Vladimir Lenin stated that the Soviet Union was surrounded by a "hostile capitalist encirclement", and he viewed diplomacy as a weapon to keep Soviet enemies divided, beginning with the establishment of the Soviet Comintern, which called for revolutionary upheavals abroad. Subsequent leader Joseph Stalin, who viewed his USSR as a "socialist island", stated that it must see that "the present capitalist encirclement is replaced by a socialist encirclement." As early as 1925, Stalin stated that he viewed international politics as a bipolar world in which the Soviet Union would attract countries gravitating to socialism and capitalist countries would attract states gravitating toward capitalism, while the world was in a period of "temporary stabilization of capitalism" preceding its eventual collapse. Various events before the Second World War demonstrated the mutual distrust and suspicion between the Western powers and the Soviet Union, apart from the general philosophical challenge the Communists made towards capitalism. 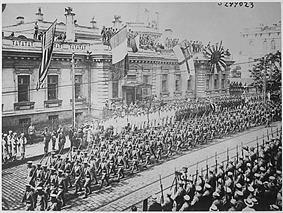 There was Western support of the anti-Bolshevik White movement in the Russian Civil War, the 1926 Soviet funding of a British general workers strike causing Britain to break relations with the Soviet Union, Stalin's 1927 declaration of peaceful coexistence with capitalist countries "receding into the past," conspiratorial allegations during the 1928 Shakhty show trial of a planned British- and French-led coup d'état, the American refusal to recognize the Soviet Union until 1933 and the Stalinist Moscow Trials of the Great Purge, with allegations of British, French, Japanese and Nazi German espionage. However, both the US and USSR were generally isolationist between the two world wars. ^ "Bernard Baruch coins the term 'Cold War'", history.com, 16 April 1947. Retrieved on 2 July 2008. ^ Heller, p. 19. "But by 1924 the Soviet Union, led now by Joseph Stalin, abandoned this policy of promoting world revolution. 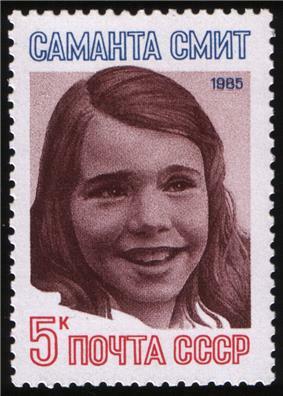 Exhausted by war against external and internal enemies, the Soviet government resolved to concentrante for the immediate future on its own economic recovery and development. ... The United States was also politically isolationist during the interwar period." ^ Fenton, Ben. "The secret strategy to launch attack on Red Army" at the Wayback Machine (archived May 28, 2008), telegraph.co.uk, 1 October 1998. Retrieved 23 July 2008. ^ Heike Bungert, "A New Perspective on French-American Relations during the Occupation of Germany, 1945–1948: Behind-the-Scenes Diplomatic Bargaining and the Zonal Merger." Diplomatic History (1994) 18#3 pp: 333–352. ^ a b Zubok, Vladislav M. (1994). "Unwrapping the Enigma: What Was Behind the Soviet Challenge in the 1960s?". In Diane B. Kunz (Ed. 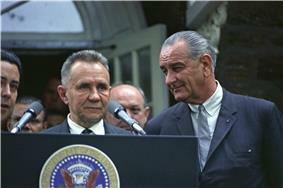 ), The Diplomacy of the Crucial Decade: American Foreign Relations During the 1960s. New York: Columbia University Press. p. 158–159. ISBN 978-0-231-08177-1. ^ James G. Blight (2002), Cuba on the Brink: Castro, the Missile Crisis, and the Soviet Collapse, Rowman & Littlefield,, p. 252. ^ Qiang Zhai, China and the Vietnam Wars, 1950–1975 (University of North Carolina Press, 2000), p. 135; Gen. Oleg Sarin and Col. Lev Dvoretsky, Alien Wars: The Soviet Union's Aggressions Against the World, 1919 to 1989 (Presidio Press, 1996), pp 93–4. ^ Dmitry Mosyakov, "The Khmer Rouge and the Vietnamese Communists: A History of Their Relations as Told in the Soviet Archives," in Susan E. Cook, ed., Genocide in Cambodia and Rwanda (Yale Genocide Studies Program Monograph Series No. 1, 2004), p. 54ff. Can be accessed at: www.yale.edu/gsp/publications/Mosyakov.doc "In April–May 1970, many North Vietnamese forces entered Cambodia in response to the call for help addressed to Vietnam not by Pol Pot, but by his deputy Nuon Chea. Nguyen Co Thach recalls: "Nuon Chea has asked for help and we have liberated five provinces of Cambodia in ten days."" ^ Christopher Andrew and Vasili Mitrokhin, The KGB and the World: The Mitrokhin Archive II (Penguin, 2006), pp. 41, 120–1. ^ "Official Energy Statistics of the US Government", EIA — International Energy Data and Analysis. Retrieved on 4 July 2008. ^ Monty G. Marshall and Ted Gurr, Peace and Conflict 2005, Center for Systemic Peace (2006). Retrieved 14 June 2008. The Cold War endures as a popular topic reflected extensively in entertainment media, and continuing to the present with numerous post-1991 Cold War-themed feature films, novels, television, and other media. In 2013, a KGB-sleeper-agents-living-next-door action drama series, The Americans, set in the early 1980s, was ranked #6 on the Metacritic annual Best New TV Shows list and is in its second season. At the same time, movies like Crimson Tide are shown in their entirety to educate college students about the Cold War. The aftermath of Cold War conflict, however, is not always easily erased, as many of the economic and social tensions that were exploited to fuel Cold War competition in parts of the Third World remain acute. The breakdown of state control in a number of areas formerly ruled by Communist governments produced new civil and ethnic conflicts, particularly in the former Yugoslavia. In Central and Eastern Europe, the end of the Cold War has ushered in an era of economic growth and an increase in the number of liberal democracies, while in other parts of the world, such as Afghanistan, independence was accompanied by state failure. In addition to the loss of life by uniformed soldiers, millions died in the superpowers' proxy wars around the globe, most notably in Southeast Asia. Most of the proxy wars and subsidies for local conflicts ended along with the Cold War; interstate wars, ethnic wars, revolutionary wars, as well as refugee and displaced persons crises have declined sharply in the post–Cold War years. Left over from the Cold War are numbers stations, which are shortwave radio stations thought to be used to broadcast covert messages, some of which can still be heard today. 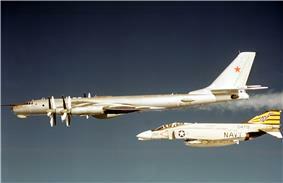 The Cold War continues to influence world affairs. The post–Cold War world is considered to be unipolar, with the United States the sole remaining superpower. The Cold War defined the political role of the United States after World War II—by 1989 the United States had military alliances with 50 countries, with 526,000 troops stationed abroad, with 326,000 in Europe (two-thirds of which in west Germany) and 130,000 in Asia (mainly Japan and South Korea). 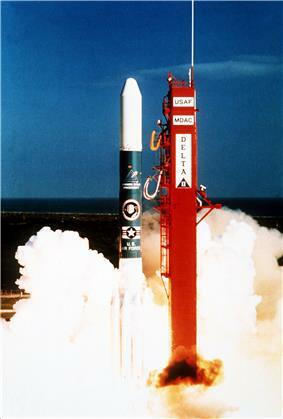 The Cold War also marked the zenith of peacetime military-industrial complexes, especially in the United States, and large-scale military funding of science. These complexes, though their origins may be found as early as the 19th century, snowballed considerably during the Cold War. After the dissolution of the Soviet Union, Russia drastically cut military spending, and restructuring the economy left millions unemployed. The capitalist reforms culminated in a recession in the early 1990s more severe than the Great Depression as experienced by the United States and Germany. 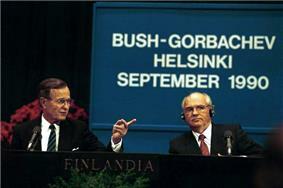 Gorbachev's permissive attitude toward Central and Eastern Europe did not initially extend to Soviet territory; even Bush, who strove to maintain friendly relations, condemned the January 1991 killings in Latvia and Lithuania, privately warning that economic ties would be frozen if the violence continued. 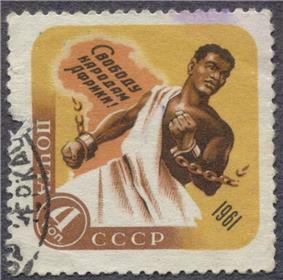 The USSR was fatally weakened by a failed coup and a growing number of Soviet republics, particularly Russia, who threatened to secede from the USSR. The Commonwealth of Independent States, created on 21 December 1991, is viewed as a successor entity to the Soviet Union but, according to Russia's leaders, its purpose was to "allow a civilized divorce" between the Soviet Republics and is comparable to a loose confederation. The USSR was declared officially dissolved on 25 December 1991. In the USSR itself, glasnost weakened the bonds that held the Soviet Union together and by February 1990, with the dissolution of the USSR looming, the Communist Party was forced to surrender its 73-year-old monopoly on state power. At the same time freedom of press and dissent allowed by glasnost and the festering "nationalities question" increasingly led the Union's component republics to declare their autonomy from Moscow, with the Baltic states withdrawing from the Union entirely. By 1989, the Soviet alliance system was on the brink of collapse, and, deprived of Soviet military support, the Communist leaders of the Czechoslovakia and East Germany, mass protests unseated entrenched Communist leaders. The Communist regimes in Bulgaria and Romania also crumbled, in the latter case as the result of a violent uprising. Attitudes had changed enough that US Secretary of State James Baker suggested that the American government would not be opposed to Soviet intervention in Romania, on behalf of the opposition, to prevent bloodshed. The tidal wave of change culminated with the fall of the Berlin Wall in November 1989, which symbolized the collapse of European Communist governments and graphically ended the Iron Curtain divide of Europe. The 1989 revolutionary wave swept across Central and Eastern Europe peacefully overthrew all the Soviet-style communist states: East Germany, Poland, Hungary, Czechoslovakia and Bulgaria, Romania was the only Eastern-bloc country to topple its communist regime violently and execute its head of state. On 3 December 1989, Gorbachev and Reagan's successor, Malta Summit; a year later, the two former rivals were partners in the Gulf War against Iraq. East–West tensions rapidly subsided through the mid-to-late 1980s, culminating with the final summit in Moscow in 1989, when Gorbachev and START I arms control treaty. During the following year it became apparent to the Soviets that oil and gas subsidies, along with the cost of maintaining massive troops levels, represented a substantial economic drain. In addition, the security advantage of a buffer zone was recognised as irrelevant and the Soviets officially declared that they would no longer intervene in the affairs of allied states in Central and Eastern Europe. In response to the Kremlin's military and political concessions, Reagan agreed to renew talks on economic issues and the scaling-back of the arms race. The first was held in November 1985 in Geneva, Switzerland. At one stage the two men, accompanied only by an interpreter, agreed in principle to reduce each country's nuclear arsenal by 50 percent. A second Reykjavík Summit was held in Iceland. Talks went well until the focus shifted to Reagan's proposed Strategic Defense Initiative, which Gorbachev wanted eliminated. Reagan refused. 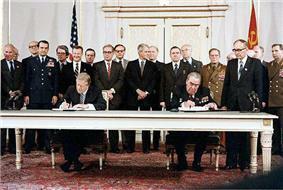 The negotiations failed, but the third summit in 1987 led to a breakthrough with the signing of the Intermediate-Range Nuclear Forces Treaty (INF). The INF treaty eliminated all nuclear-armed, ground-launched ballistic and cruise missiles with ranges between 500 and 5,500 kilometers (300 to 3,400 miles) and their infrastructure. On 1 September 1983, the Soviet Union shot down Korean Air Lines Flight 007, a Boeing 747 with 269 people aboard, including sitting Congressman Larry McDonald, when it violated Soviet airspace just past the west coast of Sakhalin Island near Moneron Island—an act which Reagan characterized as a "massacre". 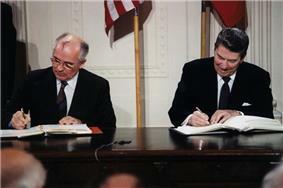 This act increased support for military deployment, overseen by Reagan, which stood in place until the later accords between Reagan and Mikhail Gorbachev. The Able Archer 83 exercise in November 1983, a realistic simulation of a coordinated NATO nuclear release, has been called the most dangerous moment since the Cuban Missile Crisis, as the Soviet leadership keeping a close watch on it considered a nuclear attack to be imminent. After Reagan's military buildup, the Soviet Union did not respond by further building its military because the enormous military expenses, along with inefficient planned manufacturing and collectivized agriculture, were already a heavy burden for the Soviet economy. At the same time, Saudi Arabia increased oil production, even as other non-OPEC nations were increasing production. These developments contributed to the 1980s oil glut, which affected the Soviet Union, as oil was the main source of Soviet export revenues. Issues with command economics, oil price decreases and large military expenditures gradually brought the Soviet economy to stagnation. By early 1985, Reagan's anti-communist position had developed into a stance known as the new Reagan Doctrine—which, in addition to containment, formulated an additional right to subvert existing communist governments. Besides continuing Carter's policy of supporting the Islamic opponents of the Soviet Union and the Soviet-backed PDPA government in Afghanistan, the CIA also sought to weaken the Soviet Union itself by promoting political Islam in the majority-Muslim Central Asian Soviet Union. Additionally, the CIA encouraged anti-communist Pakistan's ISI to train Muslims from around the world to participate in the jihad against the Soviet Union. In September 1979, Khalqist President Babrak Karmal but inclusive of both factions, filled the vacuum. 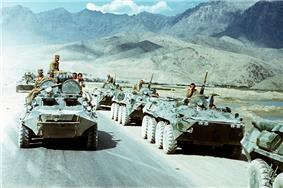 Soviet troops were deployed to stabilize Afghanistan under Karmal in more substantial numbers, although the Soviet government did not expect to do most of the fighting in Afghanistan. 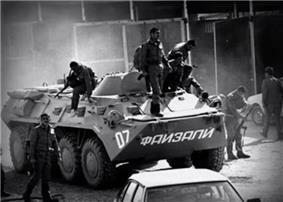 As a result, however, the Soviets were now directly involved in what had been a domestic war in Afghanistan. In April 1978, the communist People's Democratic Party of Afghanistan (PDPA) seized power in Afghanistan in the Saur Revolution. Within months, opponents of the communist government launched an uprising in eastern Afghanistan that quickly expanded into a civil war waged by guerrilla mujahideen against government forces countrywide. The Peshawar Seven insurgents received military training and weapons in neighboring Pakistan and China, as well as weapons and billions of dollars from the United States, the United Kingdom and Saudi Arabia, while the Soviet Union sent thousands of military advisers to support the PDPA government. Meanwhile, increasing friction between the competing factions of the PDPA – the dominant Khalq and the more moderate Parcham – resulted in the dismissal of Parchami cabinet members and the arrest of Parchami military officers under the pretext of a Parchami coup. 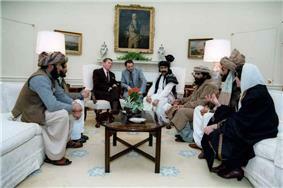 By mid-1979, the United States had started a covert program to assist the mujahideen. Meanwhile, these developments coincided with the "Conference on Security and Co-operation in Europe in 1975. The 1974 Portuguese Carnation Revolution against the authoritarian Estado Novo returned Portugal to a multi-party system and facilitated the independence of the Portuguese colonies Angola and East Timor. In Africa, where Angolan rebels had waged a multi-faction independence war against Portuguese rule since 1961, a two-decade civil war replaced the anti-colonial struggle as fighting erupted between the communist People's Movement for the Liberation of Angola (MPLA), backed by the Cubans and Soviets, and the National Liberation Front of Angola (FNLA), backed by the United States, the People's Republic of China, and Mobutu's government in Zaire. The United States, the apartheid government of South Africa, and several other African governments also supported a third faction, the National Union for the Total Independence of Angola (UNITA). Without bothering to consult the Soviets in advance, the Cuban government sent a number of combat troops to fight alongside the MPLA. Foreign mercenaries and a South African armoured column were deployed to support UNITA, but the MPLA, bolstered by Cuban personnel and Soviet assistance, eventually gained the upper hand. In Chile, the Socialist Party candidate Salvador Allende won the presidential election of 1970, becoming the first democratically elected Marxist to become president of a country in the Americas. 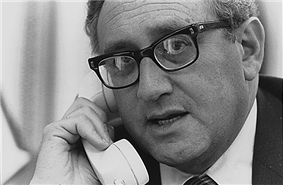 The CIA targeted Allende for removal and operated to undermine his support domestically, which contributed to a period of unrest culminating in General Augusto Pinochet's coup d'état on 11 September 1973. Pinochet consolidated power as a military dictator, Allende's reforms of the economy were rolled back, and leftist opponents were killed or detained in internment camps under the Dirección de Inteligencia Nacional (DINA). Escalating the scale of American intervention in the ongoing conflict between Ngô Đình Diệm's South Vietnamese government and the communist National Front for the Liberation of South Vietnam (NLF) insurgents opposing it, Johnson deployed some 575,000 troops in Southeast Asia to defeat the NLF and their North Vietnamese allies in the Vietnam War, but his costly policy weakened the US economy and, by 1975, ultimately culminated in what most of the world saw as a humiliating defeat of the world's most powerful superpower at the hands of one of the world's poorest nations. North Vietnam received Soviet approval for its war effort in 1959; the Soviet Union sent 15,000 military advisors and annual arms shipments worth $450 million to North Vietnam during the war, while China sent 320,000 troops and annual arms shipments worth $180 million. Under the Lyndon Johnson Administration, which gained power after the assassination of John Kennedy, the U.S. took a more hardline stance on Latin America—sometimes called the "Mann Doctrine". In 1964, the Brazilian military overthrew the government of president João Goulart with U.S. backing. In late April 1965, the U.S. sent some 22,000 troops to the Dominican Republic for a one-year occupation in an invasion codenamed Operation Power Pack, citing the threat of the emergence of a Cuban-style revolution in Latin America. Héctor García-Godoy acted as provisional president, until conservative former president Joaquín Balaguer won the 1966 presidential election against non-campaigning former President Juan Bosch. Activists for Bosch's Dominican Revolutionary Party were violently harassed by the Dominican police and armed forces. The unity of NATO was breached early in its history, with a crisis occurring during special relationship between the United States and the United Kingdom. In a memorandum sent to President Dwight D. Eisenhower and Prime Minister Harold Macmillan on 17 September 1958, he argued for the creation of a tripartite directorate that would put France on an equal footing with the United States and the United Kingdom, and also for the expansion of NATO's coverage to include geographical areas of interest to France, most notably French Algeria, where France was waging a counter-insurgency and sought NATO assistance. As a result of the Non-Aligned Movement, less-powerful countries had more room to assert their independence and often showed themselves resistant to pressure from either superpower. Meanwhile, Moscow was forced to turn its attention inward to deal with the Soviet Union's deep-seated domestic economic problems. 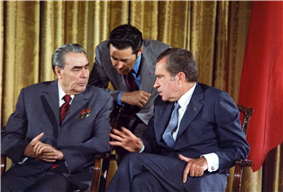 During this period, Soviet leaders such as Leonid Brezhnev and Alexei Kosygin embraced the notion of détente. 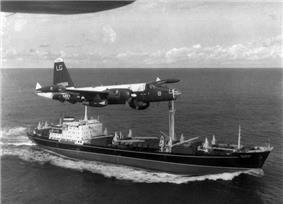 A United States Navy P-2 of VP-18 flying over a Soviet freighter during the Cuban Missile Crisis. In January 1961, just prior to leaving office, Eisenhower formally severed relations with the Cuban government. In April 1961, the administration of newly elected American President Las Villas Province—a failure that publicly humiliated the United States. Castro responded by publicly embracing Marxism–Leninism, and the Soviet Union pledged to provide further support. 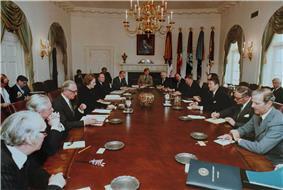 Diplomatic relations between Cuba and the United States continued for some time after Batista's fall, but President Eisenhower deliberately left the capital to avoid meeting Cuba's young revolutionary leader Fidel Castro during the latter's trip to Washington in April, leaving Vice President Richard Nixon to conduct the meeting in his place. Cuba began negotiating arms purchases from the Eastern Bloc in March 1960. Flag of the 26 July Movement. 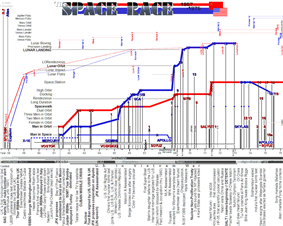 Charting the progress of the Space Race in 1957–1975. The period after 1956 was marked by serious setbacks for the Soviet Union, most notably the breakdown of the Sino-Soviet alliance, beginning the Sino-Soviet split. 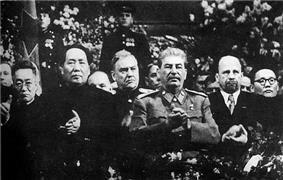 Mao had defended Stalin when Khrushchev attacked him after his death in 1956, and treated the new Soviet leader as a superficial upstart, accusing him of having lost his revolutionary edge. For his part, Khrushchev, disturbed by Mao's glib attitude toward nuclear war, referred to the Chinese leader as a "lunatic on a throne". Worn down by the communist guerrilla war for Vietnamese independence and handed a watershed defeat by communist Viet Minh rebels at the 1954 Battle of Điện Biên Phủ, the French accepted a negotiated abandonment of their colonial stake in Vietnam. In the Geneva Conference, peace accords were signed, leaving Vietnam divided between a pro-Soviet administration in North Vietnam and a pro-Western administration in South Vietnam at the 17th parallel north. Between 1954 and 1961, Eisenhower's United States sent economic aid and military advisers to strengthen South Vietnam's pro-Western regime against communist efforts to destabilize it. 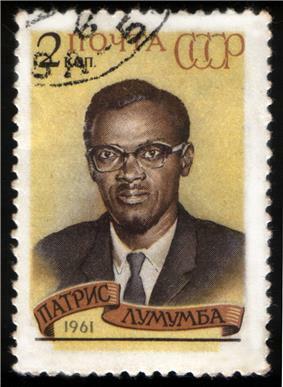 In the Republic of the Congo, newly independent from Belgium since June 1960, the CIA-cultivated President Joseph Kasa-Vubu ordered the dismissal of the democratically elected Prime Minister Patrice Lumumba and the Lumumba cabinet in September; Lumumba called for Kasa-Vubu's dismissal instead. In the ensuing Congo Crisis, the CIA-backed Colonel Mobutu quickly mobilized his forces to seize power through a military coup d'état. The United States made use of the Central Intelligence Agency (CIA) to do away with a string of unfriendly Third World governments and to support allied ones. In 1953, President Eisenhower's CIA implemented Operation Ajax, a covert operation aimed at the overthrow of the Iranian prime minister, Mohammad Mosaddegh. The popularly elected and non-aligned Mosaddegh had been a Middle Eastern nemesis of Britain since nationalizing the British-owned Anglo-Iranian Oil Company in 1951. Winston Churchill told the United States that Mosaddegh was "increasingly turning towards communism." The pro-Western shah, Mohammad Reza Pahlavi, assumed control as an autocratic monarch. The shah's policies included the banning of the communist Tudeh Party and general suppression of political dissent by SAVAK, the shah's domestic security and intelligence agency. After the death of Vyacheslav Molotov. On 25 February 1956, Khrushchev shocked delegates to the 20th Congress of the Soviet Communist Party by cataloguing and denouncing Stalin's crimes. As part of a campaign of de-Stalinization, he declared that the only way to reform and move away from Stalin's policies would be to acknowledge errors made in the past. Even though the Chinese and North Koreans were exhausted by the war and were prepared to end it by late 1952, Stalin insisted that they continue fighting, and the Armistice was approved only in July 1953, after Stalin's death. North Korean leader Kim Il Sung created a highly centralized, totalitarian dictatorship – which continues to date – according himself unlimited power and generating a formidable cult of personality. In the South, the American-backed strongman Syngman Rhee ran a significantly less brutal but deeply corrupt and authoritarian regime. After Rhee was overthrown in 1960, South Korea fell within a year under a period of military rule that lasted until the re-establishment of a multi-party system in the late 1980s. 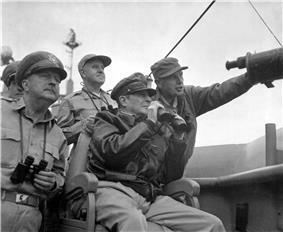 One of the more significant impacts of containment was the outbreak of the Korean War. In June 1950, Kim Il-sung's North Korean People's Army invaded South Korea. Joseph Stalin "planned, prepared, and initiated" the invasion, creating "detailed [war] plans" that were communicated to the North Koreans. To Stalin's surprise, the UN Security Council backed the defense of South Korea, though the Soviets were then boycotting meetings in protest that Taiwan and not Communist China held a permanent seat on the Council. A UN force of personnel from South Korea, the United States, the United Kingdom, Turkey, Canada, Colombia, Australia, France, South Africa, the Philippines, the Netherlands, Belgium, New Zealand and other countries joined to stop the invasion. 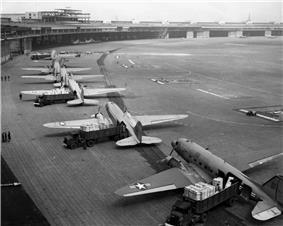 United States officials moved thereafter to expand containment into Asia, Africa, and Latin America, in order to counter revolutionary nationalist movements, often led by communist parties financed by the USSR, fighting against the restoration of Europe's colonial empires in South-East Asia and elsewhere. In the early 1950s (a period sometimes known as the "SEATO in 1954), thereby guaranteeing the United States a number of long-term military bases. In 1949, Mao Zedong's People's Liberation Army defeated Chiang Kai-shek's United States-backed Kuomintang (KMT) Nationalist Government in China, and the Soviet Union promptly created an alliance with the newly formed People's Republic of China. According to Norwegian historian Odd Arne Westad, the Communists won the Civil War because they made fewer military mistakes than Chiang Kai-Shek, and because in his search for a powerful centralized government, Chiang antagonized too many interest groups in China. Moreover, his party was weakened in the war against Japan. Meanwhile, the Communists told different groups, such as peasants, exactly what they wanted to hear, and cloaked themselves in the cover of Chinese nationalism. Stalin believed that economic integration with the West would allow Eastern Bloc countries to escape Soviet control, and that the US was trying to buy a pro-US re-alignment of Europe. Stalin therefore prevented Eastern Bloc nations from receiving Marshall Plan aid. The Soviet Union's alternative to the Marshall plan, which was purported to involve Soviet subsidies and trade with central and eastern Europe, became known as the Molotov Plan (later institutionalized in January 1949 as the Comecon). Stalin was also fearful of a reconstituted Germany; his vision of a post-war Germany did not include the ability to rearm or pose any kind of threat to the Soviet Union. The plan's aim was to rebuild the democratic and economic systems of Europe and to counter perceived threats to Europe's balance of power, such as communist parties seizing control through revolutions or elections. The plan also stated that European prosperity was contingent upon German economic recovery. 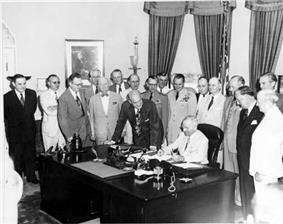 One month later, Truman signed the National Security Act of 1947, creating a unified Department of Defense, the Central Intelligence Agency (CIA), and the National Security Council (NSC). These would become the main bureaucracies for US policy in the Cold War. 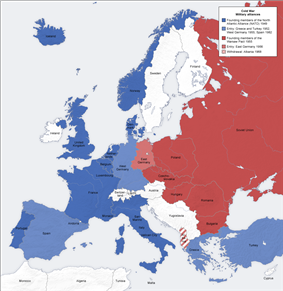 Map of Cold-War era Europe and the Near East showing countries that received Marshall Plan aid. The red columns show the relative amount of total aid received per nation. Enunciation of the Truman Doctrine marked the beginning of a US bipartisan defense and foreign policy consensus between Republicans and Democrats focused on containment and deterrence that weakened during and after the Vietnam War, but ultimately persisted thereafter. 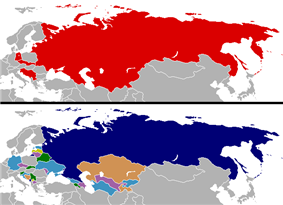 Moderate and conservative parties in Europe, as well as social democrats, gave virtually unconditional support to the Western alliance, while European and American Communists, paid by the KGB and involved in its intelligence operations, adhered to Moscow's line, although dissent began to appear after 1956. Other critiques of consensus politics came from anti-Vietnam War activists, the CND and the nuclear freeze movement. By 1947, US president Harry S. Truman's advisers urged him to take immediate steps to counter the Soviet Union's influence, citing Stalin's efforts (amid post-war confusion and collapse) to undermine the US by encouraging rivalries among capitalists that could precipitate another war. In February 1947, the British government announced that it could no longer afford to finance the Greek monarchical military regime in its civil war against communist-led insurgents (see Greek Civil War). In February 1946, Long Telegram" from Moscow helped to articulate the US government's increasingly hard line against the Soviets, and became the basis for US strategy toward the Soviet Union for the duration of the Cold War. That September, the Soviet side produced the Novikov telegram, sent by the Soviet ambassador to the US but commissioned and "co-authored" by Vyacheslav Molotov; it portrayed the US as being in the grip of monopoly capitalists who were building up military capability "to prepare the conditions for winning world supremacy in a new war". Preparing for a "new war"
As part of consolidating Stalin's control over the Eastern Bloc, the NKVD, led by Lavrentiy Beriya, supervised the establishment of Soviet-style secret police systems in the Bloc that were supposed to crush anti-communist resistance. When the slightest stirrings of independence emerged in the Bloc, Stalin's strategy matched that of dealing with domestic pre-war rivals: they were removed from power, put on trial, imprisoned, and in several instances, executed. The Central and Eastern European territories liberated from the Nazis and occupied by the Soviet armed forces were added to the Eastern Bloc by converting them into satellite states, such as East Germany, the People's Republic of Poland, the People's Republic of Bulgaria, the People's Republic of Hungary, the Czechoslovak Socialist Republic, the People's Republic of Romania and the People's Republic of Albania. 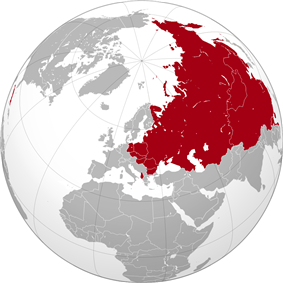 During the opening stages of World War II, the Soviet Union laid the foundation for the Eastern Bloc by invading and then annexing several countries as Soviet Socialist Republics, by agreement with Nazi Germany in the Molotov–Ribbentrop Pact. These included eastern Poland (incorporated into two different SSRs), Latvia (which became the Latvian SSR), Estonia (which became the Estonian SSR), Lithuania (which became the Lithuanian SSR), part of eastern Finland (which became the Karelo-Finnish SSR) and eastern Romania (which became the Moldavian SSR). 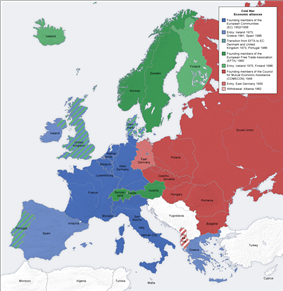 Post-war territorial changes in Europe and the formation of the Eastern Bloc, the so-called 'Iron Curtain'. At the Potsdam Conference, which started in late July after Germany's surrender, serious differences emerged over the future development of Germany and the rest of Central and Eastern Europe. Moreover, the participants' mounting antipathy and bellicose language served to confirm their suspicions about each other's hostile intentions and entrench their positions. 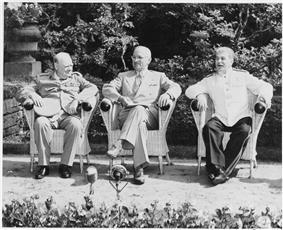 At this conference Truman informed Stalin that the United States possessed a powerful new weapon. Following the Allies' May 1945 victory, the Soviets effectively occupied Central and Eastern Europe, while strong US and Western allied forces remained in Western Europe. 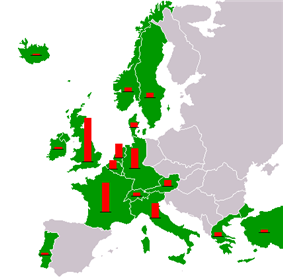 In Allied-occupied Germany, the Soviet Union, United States, Britain and France established zones of occupation and a loose framework for parceled four-power control. 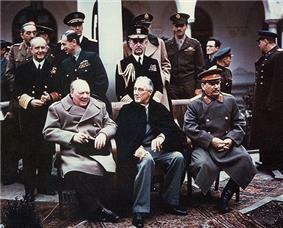 Further Allied negotiations concerning the post-war balance took place at the Yalta Conference in February 1945, albeit this conference also failed to reach a firm consensus on the framework for a post-war settlement in Europe. In April 1945, President Roosevelt died and was succeeded by Harry S. Truman, who distrusted Stalin and turned for advice to an elite group of foreign policy intellectuals. Both Churchill and Truman opposed, among other things, the Soviets' decision to prop up the Lublin government, the Soviet-controlled rival to the Polish government-in-exile in London, whose relations with the Soviets had been severed. The Western Allies were divided in their vision of the new post-war world. Roosevelt's goals – military victory in both Europe and Asia, the achievement of global American economic supremacy over the Mediterranean, ensuring the survival of the British Empire, and the independence of Central and Eastern European countries as a buffer between the Soviets and the United Kingdom. The Soviet Union sought to dominate the internal affairs of countries that bordered it. During the war, Stalin had created special training centers for Communists from different countries so that they could set up secret police forces loyal to Moscow as soon as the Red Army took control. Soviet agents took control of the media, especially radio; they quickly harassed and then banned all independent civic institutions, from youth groups to schools, churches and rival political parties. Stalin also sought continued peace with Britain and the United States, hoping to focus on internal reconstruction and economic growth.